USAID Transform: Primary Health Care works in close partnership with the Ethiopian government to implement its Health Sector Transformation Plan and end preventable maternal and child deaths. Using a health systems strengthening approach, the project builds the capacity of regional health bureaus to more effectively manage the way primary health care services are delivered at the woreda level, in primary hospitals, health centers, and health posts. The work involves improving the skills of health managers to lead, plan, budget, and supervise; increasing the use of actionable data for decision-making; introducing quality improvement approaches, and more. USAID Transform: Primary Health Care also introduces, tests, and scales lifesaving reproductive, maternal, newborn, and child health innovations such as mobile ultrasounds, solar suitcases, and intrauterine balloon tamponades. The project is expected to increase the use of antenatal care, contraception services, skilled deliveries, and child health services, thus contributing to improved birth outcomes for mothers, children, and their families. 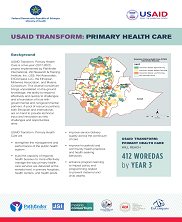 USAID Transform: Primary Health Care operates in 360 woredas in Tigray, Amhara, Oromia, and Southern Nations, Nationalities and Peoples (SNNP) regions. The project serves more than 53 million people and will reach more than 400 woredas by 2021. The program is implemented by a consortium of organizations which includes Pathfinder International, JSI Research & Training Institute, Inc., EnCompass, Malaria Consortium, Abt Associates, and Ethiopian Midwives Association in collaboration with local government and nongovernmental partners.